In honor of the Sci-Fi channel airing their Sci-Fi Original movie ‘Red Faction: Origins’, I dusted off my ten year old PC Game version of the first Red Faction videogame and went about the process mowing down stupid Earth Defense Force guards, guards that often tried to run and got stuck on poles and stuff, making it real easy for me to end their worthless lives. Admittedly I haven’t played a Red Faction game since that first game, but I hear they are all fine games. Thus we have Red Faction: Origins, which is supposed to be the bridge between the last Red Faction game, Red Faction: Guerilla, and the latest game Red Faction: Armageddon. To be honest we don’t care about any of that. We just know that it’s Saturday night and we have Sci-Fi original movie to watch. On Sunday night via DVR. And if the Sci-Fi Channel keeps delivering to us these halfway decent movies, we might have to change our opinion of them. Dateline Mars. The revolution is over, the oppressive EDF has been dispatched and the hero of the revolution, Alec Mason (Robert Patrick), is a mess. Fifteen or so years ago the rival Marauders broke into Alec’s home, killed his wife and daughter, and they would’ve killed his young son if he didn’t get away. This young son has grown up to be strapping young soldier Jake Mason (Brian J. Smith) and he told his father back then, and he’s telling his drunken father today that soldiers dressed in white killed his mother, not the Marauders, and he has also told his father that he believes, in his heart of hearts, that his baby sister is still alive somewhere. Family issues aside, Jake still has a job to do and on this day the job requires Jake to take a team of soldiers and a crazy hot technical engineer named Tess (Danielle Nicolet) out to the badlands to go on a salvage hunt. Damn if Jake doesn’t see these soldiers in white and damn if Jake doesn’t engage in a little skirmish with one of these soldiers, takes off this soldiers mask and finds himself face to face with a young woman he absolutely, positively believes to be his sister. You see if this wasn’t his sister they’d be shooting at other, but siblings know, you know? and the hot engineer… it’s complicated… will traverse into the badlands of the Marauders, make a couple of marauding friends, try to find out who these mysterious soldiers in white are, what their ultimate plan is and why they stole his baby sister. Jake will get answers for all of these questions and none of these answers are good. Just know the leader of these soldiers in white, The White Faction I believe they call themselves, is played by Tamer Hassan which means he’s a bad dude. It’s going to be up to Jake and the hot engineer, who Jake somehow convinced to take her shirt off, to save all of Mars. It’s complicated. 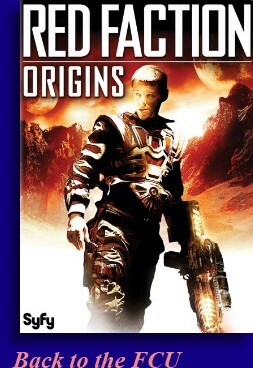 Even though I found ‘Red Faction: Origins’ to be completely functional as a form of disposable entertainment, and I know one of the purposes of this movie is to move copies of ‘Red Faction: Armageddon’ off the shelves, I still think a much better movie scenario would’ve been to start off where the original game started off. For one, the title ‘Red Faction: Origins’ would make more sense but more so because the original Red Faction game has a better, more rich story to tell and the opportunity to toss in more action would have been greater as well. Oh well. Since we didn’t get that, we will deal with what we did get and to that end we got ourselves a real live, legitimate, science fiction based movie. It takes place on Mars, there’s space ships and futuristic weapons and stuff, and there’s a crapload of science fiction type actors in this movie such as Robert Patrick (T2), Kate Vernon (Battlestar Galactica), Danielle Nicolet (Stargate: SG-1) and Brian J. Smith (Stargate: Universe). You can’t beat that. But is it any good? Well, it’s not that bad actually, even though it’s probably more of a family melodrama with a science fiction backdrop than a Sci-Fi action movie. Brian J. Smith was solid as our hero, you know you can always count on Robert Patrick to come through in a pinch with a good performance, Danielle Nicolet is always fun to look at and provided a touch of humor to lighten things up and the combination of the mysterious soldiers in white, along with Jake’s tireless search for his sister does a decent job of moving the story forward while also giving those who enjoyed the videogames a little something to hold on to. However ‘Red Faction: Origins’ did feel more like a pilot for a television show than a full fledged movie. We’re shown an awful lot of characters and introduced to quite a few subplots all encased around a preponderance of talkity talk which would probably be more relevant in future episodes, as opposed to being relevant or interesting in this movie we’re watching. The special effects and CGI effects were better than expected but the action sequences, as far as the fighting and shooting goes, not as good as expected. This is probably why we got more dialog and drama than all-out action. ‘Red Faction: Origins’ was good enough. If down the road it does transform into a television show or morphs into another movie, I’d watch it without reservation. Well, maybe a little reservation, but I’d watch it nonetheless.